Leyton Orient recorded their first National League victory of 2018 with a 2-1 win at fellow strugglers Halifax Town. 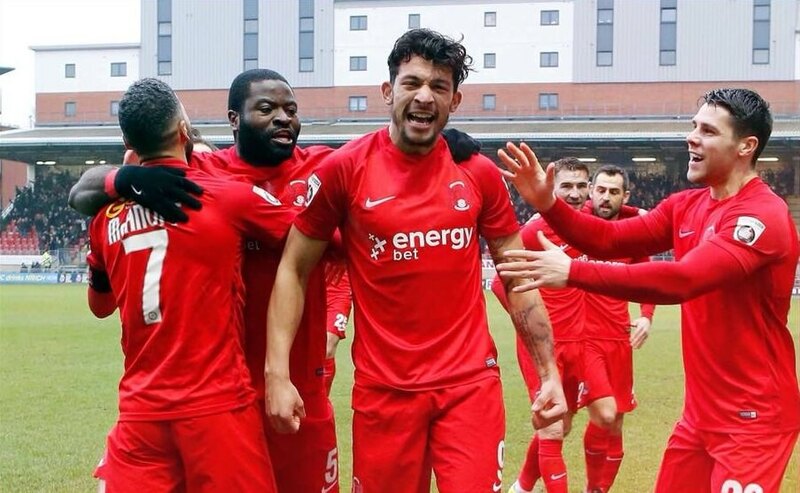 A first win in five league games couldn’t come soon enough for Justin Edinburgh’s men as Macauley Bonne and Josh Koroma won the game for Orient. The win puts the O’s above both Halifax Town and Hartlepool United and means they are 5 points clear of Solihull Moors in the last relegation zone position although they need to be careful with Solihull Moors in good form at the current time and Barrow with two games in hand on all the teams above them due to their recent cup exploits. This game was originally postponed a week ago on Saturday due to a waterlogged pitch but it was the home side that went home soggy and pointless as a determined Leyton Orient team knew a defeat would leave them in terrible danger at the wrong end of the table. A crowd of 1,352 had braved a chilly January night in the north of England to see these teams do battle once more having played against each other in the football league lower divisions many times previously. All the important action came in the first half as the visitors went into the break with a slender 2-1 cushion which they were able to keep until the final whistle. Orient opened the scoring when Craig Clay found Dan Holman free on the edge of the area before the forward played a through ball for Macauley Bonne to find the net from just inside the area with 18 minutes on the clock. This was Bonne’s 17th goal of the campaign and it’s likely Orient would be marooned in the relegation zone without his input this season. This didn’t daunt Halifax Town and they came back at the east Londoners and levelled 14 minutes later through Tom Denton after a driven cross from Josh MacDonald found the winger at the far post to easily tap in from close range. This didn’t dent Orient’s guile either and in return they came straight back into the match and retook the lead as Josh Koroma scored what turned out to be the winner for the visitors six minutes before the break when he shrugged off his defender and drilled into the bottom corner past Sam Johnson. Halifax were getting agitated at times and three players found referee Peter Gibbons little black book namely Hibbs, Collins and Moyo that sounds like a fish finger manufacturer if ever I heard one. Orient attacked straight after the restart with Bonne and Holman looking a threat from the off while Koroma was also proving to be a nuisance for the Halifax defence. He won the O’s a free kick in the 50th minute, but McAnuff’s shot took a deflection and went wide. Orient continued to push and probe and fine interchanging between Bonne and Clay saw the former get a sight of goal, but O’s top goalscorer could only shoot wide with 55 minutes on the clock. Halifax came back alls guns blazing and really controlled the match for a sustained period in the second half and it was only good defending from Elokobi, who firstly blocked a cross from the right before heading a corner clear, that ensured O’s remained 2-1 ahead at the Shay with less than a quarter of the match to play. The O’s perhaps should have killed the game off with 13 minutes to go when forward duo Bonne and Holman linked up again, but the former couldn’t beat keeper Sam Johnson from a tight angle. It was the east Londoners again who threatened with three minutes to go when Josh Koroma played Bonne in, he found McAnuff, but the skipper couldn’t beat Johnson. There were five minutes of stoppage time, which only added to the nerves of the tiny travelling Orient support of just 133 in total but when the referee blew for full time they knew how important these three points could be come the end of the season.